For over two decades, Japan has been the center of the MMA universe in Asia, with fighters like Kazushi Sakuraba, Takanori Gomi, “Mach” Sakurai, Genki Sudo, Rumina Sato, Shinya Aoki, “Kid” Yamamoto and Masakatsu Funaki all proudly representing the Land of the Rising Sun on the world stage. But now Japan is not alone in producing world-class mixed martial artists, with South Korea, China and the Philippines all seeing fighters making it to the UFC in recent years. On Saturday, June 23, fans in Singapore and those watching around the world on UFC FIGHT PASS, will see 13 of these fighters, making it clear that Asian MMA is on the upswing in 2018 and beyond. Here’s a look at this intriguing baker’s dozen. Opening up the main card against Li Jingliang, Daichi Abe is a power hitter who is obviously ambitious, because taking on the experienced “Leech” in just his eighth pro fight is a gutsy move. A black belt in judo, Abe has been letting his fists do the talking, as he’s earned four of his six wins by knockout. Tokyo’s Shinsho Anzai may have been brought into the MMA fold by watching K-1 legend Peter Aerts on TV, but wrestling has been the go to discipline for the “Animal,” who meets Jake Matthews in Singapore. Winner of two straight in the Octagon, Anzai may be from Japan, but his gritty style brings to mind that of a Midwest wrestler. The son of former world boxing champion Rolando Navarrete, Paranaque City’s Rolando Dy has fighting in his blood, and he also brings his dad’s warrior spirit with him into the Octagon. After a pair of losses to kick off his UFC career, Dy outpointed Wuliji Buren in November, and he’ll look to make it two in a row when he meets New Zealand’s Shane Young. On his UFC bio, Naoki Inoue said that his “goal is to become like UFC flyweight champion Demetrious Johnson.” Ambitious stuff, but the 21-year-old is off to a good start in the kingdom of “Mighty Mouse,” racing out to an 11-0 record that includes a decision win over Carls John de Tomas in his UFC debut a year ago. On June 23, he faces Matt Schnell. 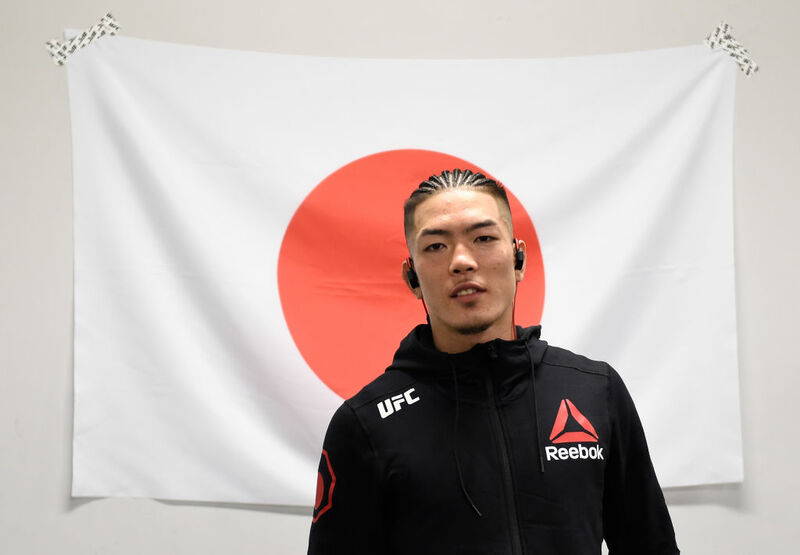 Sporting a 1-3 record in his last four bouts after a 2-0-1 start to his UFC career, Teruto Ishihara has some work to do to regain the momentum he had in 2016. But with the Team Alpha Male squad behind him and the fight-ending power that hasn’t left him, “Yashabo” will be in a statement-making mood when he faces Petr Yan. South Korean flyweight Ji Yeon Kim has split her first two UFC bouts, losing to Lucie Pudilova before defeating Justine Kish, and while she went the distance in both, she has finished four of her seven victories, so she may be fishing for an early night against TUF 25’s Melinda Fabian. You’ve got to like a fighter stepping into the Octagon with the nickname “Demolition Man.” And while Mandaluyong City’s Jenel Lausa hasn’t delivered any Alistair Overeem-esque performances in the Octagon yet, his 7-0 (4 KOs) pro boxing record proves that he’s got some hands that he’ll likely want to throw at submission specialist Ulka Sasaki as he attempts to even his UFC record at 2-2. 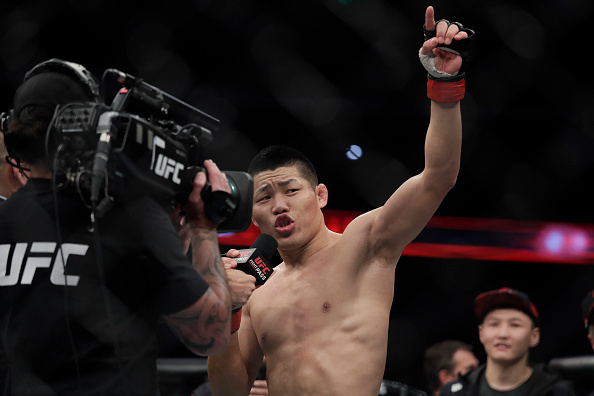 One of Asia’s best bets to become a breakout star in the coming years, Beijing’s Li Jingliang is 6-3 in the UFC with four finishes and three post-fight bonuses in a row. If that’s not enough reason to want to see “The Leech” in action, you’re just not paying attention. We won’t hold that against you, especially if you check Li out in action on June 23 against Daichi Abe. Japanese flyweight veteran has a lot of talent. You don’t get to 20 wins in this sport without it. But consistency has been an issue for the Shizuoka southpaw, who has only managed a 3-4 record in the Octagon. In Singapore, he takes on Jenel Lausa, and if he can implement his ground game on “The Demolition Man,” it could be a turning point for his promising career. A 15-second knockout of Bobby Nash was quite the introduction to Beijing’s Kenan Song, and with a mix of power, experience and work with the Jackson-Wink team in Albuquerque, this 28-year-old welterweight will be one to watch against Hector Aldana next week. Just 20 years old, Song Yadong was impressive in submitting Bharat Khandare in the first round in his UFC debut in November, and while the bantamweight prospect is still raw, he’s getting a big step up when he meets Brazilian veteran Felipe Arantes in Singapore. Russia’s Petr Yan lands on the list thanks to his grandfather being Chinese, and if he continues to impress in the UFC like he has on the regional circuit, this bantamweight has star potential. In Singapore, he makes the walk to the Octagon for the first time against Teruto Ishihara. Currently sporting a seven-fight unbeaten streak that includes a win over Kailin Curran in her UFC debut, Beijing’s Xiaonan Yan meets Brazilian prospect Viviane Pereira in an interesting matchup that could very well propel the winner into the strawweight top 15. 2018 UFC Hall of Fame Induction Ceremony tickets go on sale today!